The introduction of electric lighting during the 1880s attracted attention everywhere. On January 27, 1911, a group of Vassar trustees met in New York City at the home of the naturalist and Vassar trustee, Albert S. Bickmore, for a special meeting to evaluate the condition and the future of Vassar’s heating and lighting system. When the trustees had settled themselves in Bickmore’s home, facing the west side of Central Park fifteen blocks from the Natural History Museum, of which Bickmore was a primary founder, President James Monroe Taylor began the meeting with a brief memorandum addressing the necessity for immediate change in the college’s illumination. Trustee Samuel D. Coykendall and Vassar parent Frederick S. Blackall, who had conducted an extensive, yearlong survey of the equipment and layout of the gasworks, presented their proposal for electrifying Vassar’s campus along with a proposed budget for the work from the firm Lord & Co. The plan and the budget were unanimously adopted. Electrification had been long anticipated at the college. Both New England Building, built ten years earlier, and Sanders Chemistry, built in 1909, were constructed with both gas and electric capabilities. Electrical lighting, though a luxury to many Americans, had become common on the streets and sidewalks of most major American cities in the first two decades of the twentieth century. The City of Poughkeepsie had introduced electric lighting before many other American cities. Dorsey Neville, a local philanthropist, had erected a dynamo at Bullard’s Factory on Main Street in 1884; a year later, the Poughkeepsie Electric Light and Power Company purchased Mr. Neville’s interests, and in April, 1886, the company secured a contract for the lighting of the streets by electric arcs, a powerful type of electric lighting suited to outdoor use. The cost to the company was some $18,000 per annum. (1) Vassar’s installation of electricity might, in comparison, seem overdue, but it happened at about the same time as the majority of like-sized colleges. By the time Vassar was ready to implement electrical lighting, the incandescent light bulb had become the standard source of artificial light throughout the United States. The trustees' Executive Committee, waiting until the cost of incandescent lighting had dropped below that of gas lighting, acted at the right time, both technologically and economically. The expiration of the basic Edison lamp patents in 1894 had allowed for increased competition. And the introduction of phosphorus-exhaust bulbs two years later along with the adoption of mass-production techniques allowed for much cheaper lamps than the solely gas-fueled type that had been on the market since the 1860s. (2) Residential rates per kilowatt-hour had dropped from twenty cents in 1897 to about nine cents in 1912; large-scale, industrial rates experienced a similar decline. Further, steam turbines had been introduced to commercial and industrial institutions. Under the supervision of Trustee Coykendall and Blackall, the president of a large Rhode Island manufacturing firm, the integration of direct current incandescent lighting with the previous system of coal-fed steam boilers fit nicely into a long-term plan that allowed for the relatively manageable installation of steam turbines twenty years later. 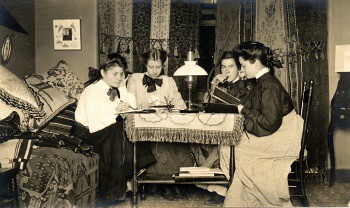 Studying around a Welsbach gas burner in Main building, circa 1905. The supply of gas to the individual dormitory rooms had been an issue of perpetual concern for both the college administration and the student body. Up until the 1870s, light in each dormitory room was supplied by small, two-foot gas powered burners under the assumption that students preferred to study in the parlors—where six-foot burners blazed without restriction—and not in their individual rooms. The two-foot burners, which were notoriously ineffective for comfortable study, were replaced with four-foot burners after reports reached the administration of students tampering with the tips of the burners in order to increase the stream of gas; it was said, too, that certain enterprising and gutsy students attempted to augment the gas flow with a carefully placed punch to the gas regulator. The college reported twenty cases of these “self-improved” lamps. 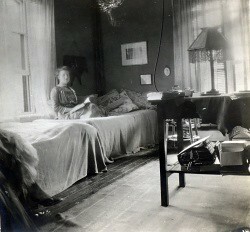 A student in her newly electrified room in Main Building, circa 1912. Once Vassar's plan was approved, Lord & Co. began installation early in 1911. By the commencement of the 1911 fall semester, electrical lighting and heating had been effectively installed in Main building. The rest of the campus, including residence halls, academic buildings, and the library followed soon after, as electrical outfitting quickly reached completion by the early months of 1912. Once electrical lighting had become fully installed in the hallways of Main, students were provided with a gooseneck lamp in addition to the gas lamp, allowing them to arrange the light in almost any position. The gooseneck lamp also allowed for a sleepy roommate to rest as working students could direct the light to the corner of the room, effectively illuminating one side of the room and leaving the other in relative darkness. Instead of having to cope with the overhead flickering of the gas lamp, students began to prize the convenience and utility of electric light in their dormitory rooms—not to mention that maneuverable light lent itself well to festive gatherings, Halloween parties in particular. All of the energy for the new installations was produced in Vassar's own campus power house. 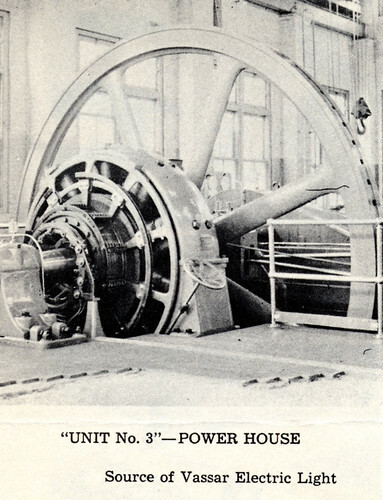 The power house continued to function as the college's primary energy source until 1955, when the college switched over to buying outside electricity from Hudson Heat and Electric. In 1973, the power house was the first of several neighboring utility buildings to be adaptively re-used, when it opened as the Hallie Flanagan Davis Powerhouse Theater. Adjusted for subsequent inflation, in 2008 the city's electrification venture would cost some $400,000. Air-exhaust had been a major problem of electric light production up to this point. However, it was found that the vacuum produced when a very small amount of red-phosphorous vapor was placed in the exhaust tube of the bulb while the filament was heated slightly above normal operating temperature improved the device's air-flow, vastly expediting manufacture. Arthur A. Bright, The Electric-Lamp Industry: Technological Change and Economic Development from 1800 to 1947, New York, 1949. “’The Shame of Vassar,’ Again,” The Springfield Republican, December 26, 1873. Edmund Platt, The Eagle’s History of Poughkeepsie: From the Earliest Settlements 1683 to 1905, Poughkeepsie, 1905. Student Letters, collection from 1911-1912, Volume 27, Vassar College Special Collections. Vassar Board of Trustee Minutes from January 27, 1911, Trustee Minutes 1892-1912, Vassar College Special Collections.